One of my favorite cards from The Underway. Gang Sign is the "Criminal Clot". 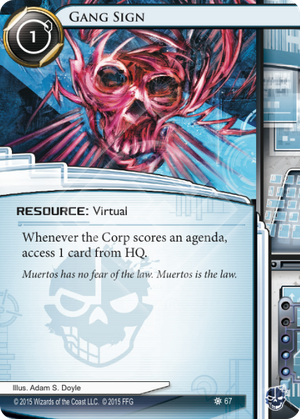 In slow-advance decks you keep it on hand until you see the corp advance an agenda in a server you can't get into. Drop it. Watch the Corp player's face break out in sweat. In fast advance decks you can drop it immediately to hamper their FA plays. In any case, one way to look at it is that it is a card that adds an additional condition for scoring windows. There will be games where it does nothing. But there will also be games where it will close a scoring window where they would have been one otherwise. Additionally, I really like the drama of the horrible situation it gets the corp in. Waiting won't do much to decrease the agenda count on HQ. So do you score one now and hope they miss the rest? Or do you wait for a Jackson and risk the agendas being stolen on an HQ run? Beautiful. It synergies greatly with HQ Interface because you get to see more cards. It's great in Leela Patel: Trained Pragmatist since you can get deadly double-bounces off it. Could also work well in Iain Stirling: Retired Spook. I've seen people combine this with other on score effects like Turntable or Logos. Overall, a great new card that we might see more of in the future. Certainly worth a try! This card is beginning to see a lot of play, especially combo'd with Leela Patel: Trained Pragmatist and HQ Interface. If you cannot get your agendas out of your hand (eg. into archives with a Jackson Howard ready), scoring one out on the board can cause a catastrophic chain of events (Leela bounce, HQ access, agenda steal, Leela Bounce again). That's at least two unrezzed cards flipped into your hand, not to mention the agenda she steals. Even if you scored the agenda after your 2nd instead of your 3rd, that can still leave your board in a miserable state, opening you up to further brutality when the runner's turn begins. Like Valencia's Blackmail, NBN's Astro Train, or Wayland's Scorched Earth, this is a card devestating enough that it's worth specifically preparing for it if it's in your meta. Snare, straight up. This card gets splashed around a lot anyway - Gang Sign just makes it more attractive. Get it in your hand and keep it there. The fun thing about Gang Sign (for the corp) is that once it's installed, the runner doesn't have a choice. They're slamming into your HQ whether they like it or not. A smart runner may smell the beat-down coming, and choose not to install it in the first place, but once it's down, they're in trouble. Runners, if you're playing Gang Sign, seriously consider playing Feedback Filter as well. You'll notice the common theme of all the above suggestions is that they all do net damage. It's expensive, but only when you actually need to use it (which probably isn't often). If you install Gang Sign when you shouldn't have, an Aesop's Pawnshop can be a life-saver. So, after about a dozen times of looking at this card, I realized something insane: this card is not Unique. That means that when you have two or even three out, you get Legwork every time the Corp scores. With HQ Interface, you could conceivably access the entire hand. This is sick against Glacier, as Agendas will stock up in there in anticipation of a scoring window. It is also great against FA as it can help you even the race for 7 through hand pressure. What seemed to be a cool, fringe effect may turn out to be a real force to be reckoned with, and may even contest Legwork as lategame HQ pressure.